Several new Tech blogs are created daily, as the searches are very high. Being wise while choosing a theme for your blog is very crucial as it can also make a good and bad impact on the blog. The Main First criteria of tech blogger templates are, it should be SEO Friendly, Clean Widgets and should load fast enough. Wondering where you can get some Responsive Blogger Templates free download for your Tech Blogs, we made some search and hard work to suit your blog. There could we several themes on the web which might be for different kind of blogs like news, travel, education, tech, Templates for tutorials blogs and much more. Using the same theme for all kind of blogs is not okay at all. If you are starting a tech blog, these themes are for you. This is a very good template for tech and news blogs. You can get it for free from the below link or buy a full version of it from Theme Expose to get the full access to customization. It is fully responsive and you would love the design and your readers too. Two versions are available for this ChicMag (For Tech Blog) and ChicMag Carousel (For Travel or Personal). ChicMag is better for tech blogs. Check out the Demo, it’s really awesome but make sure you optimize your images before uploading. Some key and highlighted features of it. 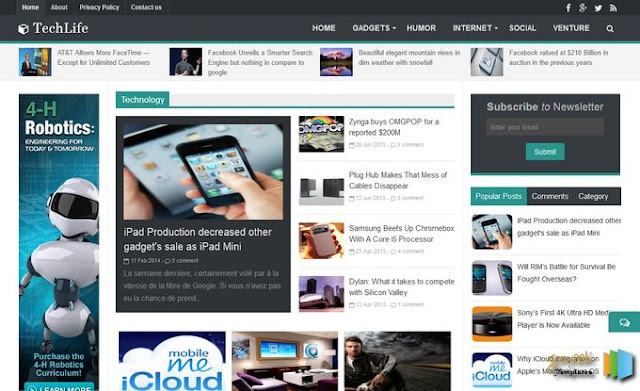 This is one more perfect theme for tech blogs, it has a three column layout which can give a good conversion rate. So you can place widgets both the side of the content. It has a great looking sticky header which is an added advantage to it. A good responsive theme with an extended width as its a 3 column template. 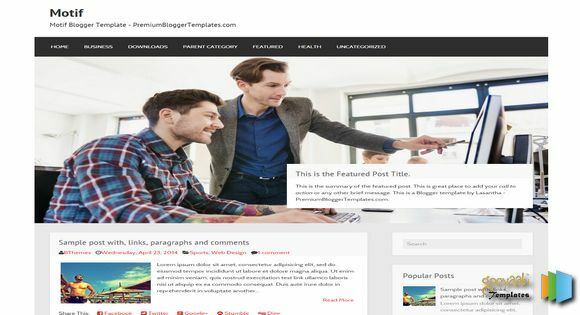 And this one of the best responsive blogger templates is free to download. It comes with decent and clean looking menu with some featured posts below it. Which is quite important to show the work. Goes very well with the tech blogs which a decent sidebar. Responsiveness is an added advantage to it. Well designed Subscription and Social Icon at the footer. I love this blogger template, it a grid style home page with an elegant header following with the search bar, Completely responsive on all the devices. Great looking widgets at the sidebar too. Perfect add placement slots had been designed. Social Sharing Icons on the post snippet itself. Fast loading and great appearance is basically any theme requirement. Glorious loads fast and very SEO Friendly, which has a slider widget at the top and it’s quite cool. Simple and great looks with a green and white theme, of course, you can change that if you have some knowledge of HTML. This one goes very well with the news and Tech Blogs. Highly recommended. Featured posts at the top, which is an essential factor for the tech blogs. Social Palette at the sidebar and good Ads Slot. This is perfectly suitable for any kind of magazine blog. Don’t just go with the name “mag”, it is a perfect fit for tech blogs as well. It fulfills all the requirement of tech theme should have. It comes with a sticky header, featured posts and subscription box as well. Recent post with well-designed thumbnail. Simple and elegant look with a slider for the Images at the top, Cool subscription box, and a clean layout. As the name itself says the story, simple tech is a very simple blogger theme and looks great. It has a sticky header, and add slot (468*60) as well. Subscription Box just looks awesome. Overall it’s a well-designed theme with some decent thumbnails for the post. We can also find social sharing icons and pages menu at the top. Which makes this theme a complete one. Hey hi This article is nice . I want blogger theme like this website . Yes, these are hand picked best blogger templates, after trying out so many. Niche template, thanks brother ? Hey! Thanks Navin for Sharing these 10 Free Responsive Blogger Templates for Technical Blogs. These all helps me a lot to choose a perfect template.